Ven. 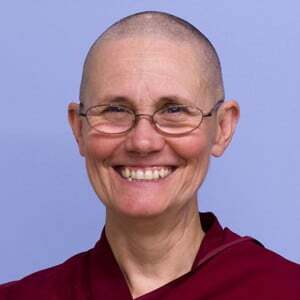 Thubten Chonyi began attending classes with Venerable Thubten Chodron at Dharma Friendship Foundation in Seattle in 1996. After completing a three-month Vajrasattva retreat in 1998, she made a strong commitment to study and practice the Dharma as a lay student. After moving to Idaho in 2001, she was a founder and leader of the Coeur d’Alene Dharma Friends, a founder of Friends of Sravasti Abbey, and a frequent Abbey visitor before realizing her extraordinarily precious circumstances. Ven. Chonyi moved to the Abbey in June 2007 and took śrāmaṇerikā and śikṣamāṇā vows in May 2008. See photos of her ordination. Along with Ven. Jigme, Ven. Chonyi received bhikshuni ordination at Fo Guang Shan in Taiwan in 2011. See the photos. Ven. Chonyi’s formal education was in theatre at Wesleyan College in Macon, GA. She worked for many years as a performer, publicist, fundraiser, and producer in the performing arts. She was a Reiki teacher and practitioner for 19 years and was Managing Editor of Reiki Magazine International. At the Abbey, Ven. Chonyi is involved with publicity and inviting generosity and assists in managing the kitchen.